FROGBLOG readers are bound to remember that Franziska Knuppe was the celebrity who took part in the 2012 Art Advent Calendar charity event with ENERGETIX and was depicted in the work of art behind the 15th door. ENERGETIX has been able to extend its collaboration with her: she agreed to model the photos for the new catalogue. So she stood in front of the camera – together with pop singer Ronan Keating – for ENERGETIX. She can be seen in the new catalogue for the 2013/2014 season – with great jewellery and great outfits (so much can already be revealed). Participants at the 2013 ENERGETIX Catalogue Launch should be doubly pleased: Franziska Knuppe will also be there at the mega event in Berlin. About her: This internationally successful model (discovered by couturier Wolfgang Joop in a Potsdam café) has walked the catwalk for Issey Miyake, Vivienne Westwood and many other fashion designers and labels and posed for numerous renowned star photographers like Peter Lindbergh, Jim Rakete, Iris Brosch, Roxanne Lowit and Kristian Schuller. The cool blonde has been the face of numerous campaigns – e.g. for Triumph, Joop, Oasis and Reebok – and adorned the covers of Cosmopolitan, Marie Claire, the German Elle, and other magazines. In a few days’ time everybody – both distributors and ENERGETIX staff – will be making their way to Berlin, to the 2013 ENERGETIX Catalogue Launch. It will be the first time in Germany’s trendy capital. And Rea Garvey, Ingo Nommsen, Joey Kelly, Ralf Bauer and many more will also be boarding their planes, trains and cars in order to appear on the big stage on time on 31 August. Everyone at ENERGETIX headquarters in Bingen is working – hand in hand -– to make it an unforgettable weekend and the excitement is almost tangible. 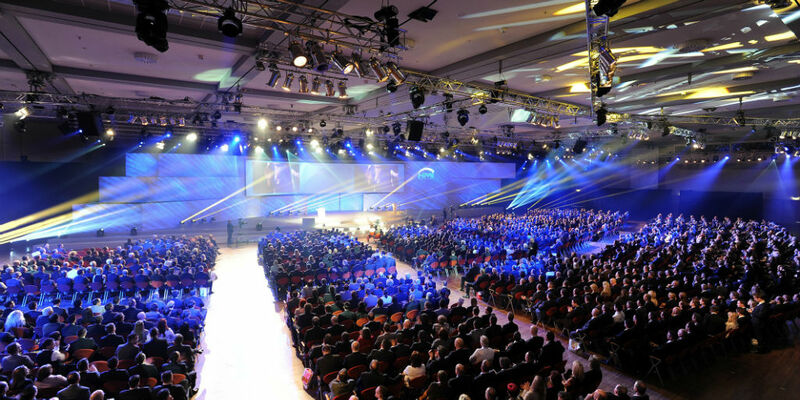 How will distributors and guests react to the atmosphere and ambiance of the Estrel Convention Centre and to the items on the training and the gala programmes? Can this year’s Catalogue Launch in Berlin be even better than last year’s awesome event? And what will be the reactions to the eagerly awaited jewellery in the new collection? At an in-house presentation to the ENERGETIX staff a few days ago the new creations met with a great reception. We will know more in a few days’ time: let the show begin! NB: To get in the mood, you can take another look at the highlights of the 2012 ENERGETIX Catalogue Launch here. The ENERGETIXDRIVE Distributor Car Programme continues to be in vogue: a number of other distributors were delighted to receive stylish new cars over the last few weeks. 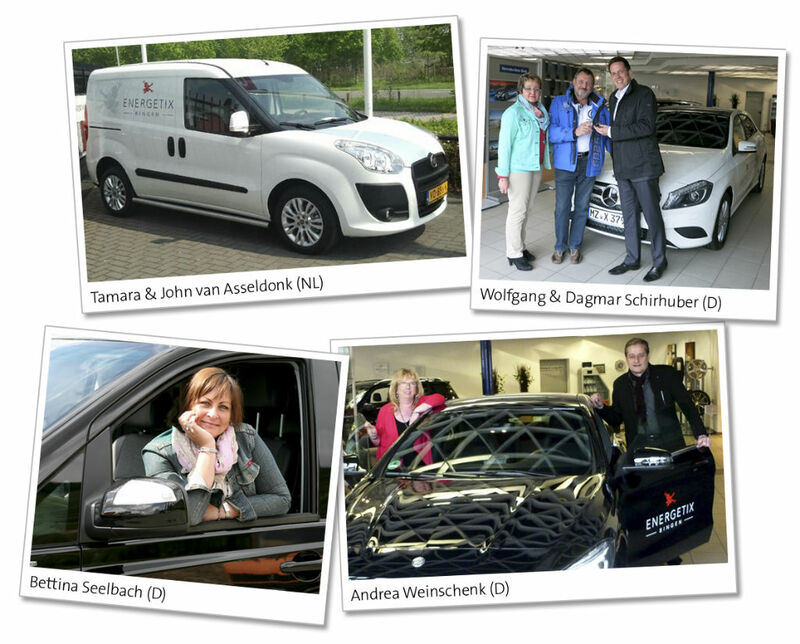 We wish Marlies and Frank Hems (G), Wolfgang and Dagmar Schirhuber (G), Bettina Seelbach (G), Erika Ulrich (CH) Tamara and John van Asseldonk (NL) and Andrea Weinschenk (G) a lot of pleasure with their stylish new cars. DSA certified: ENERGETIX Bingen, a strong brand that keeps its promises – you can depend on it! ENERGETIX Bingen is a member of the leading direct selling associations: BDD, FVD, DSA USA, Seldia and DSA UK. The company was recently honoured by the United States Direct Selling Association (DSA). The American trade association DSA USA represents the interests of about 200 member companies involved in direct selling. 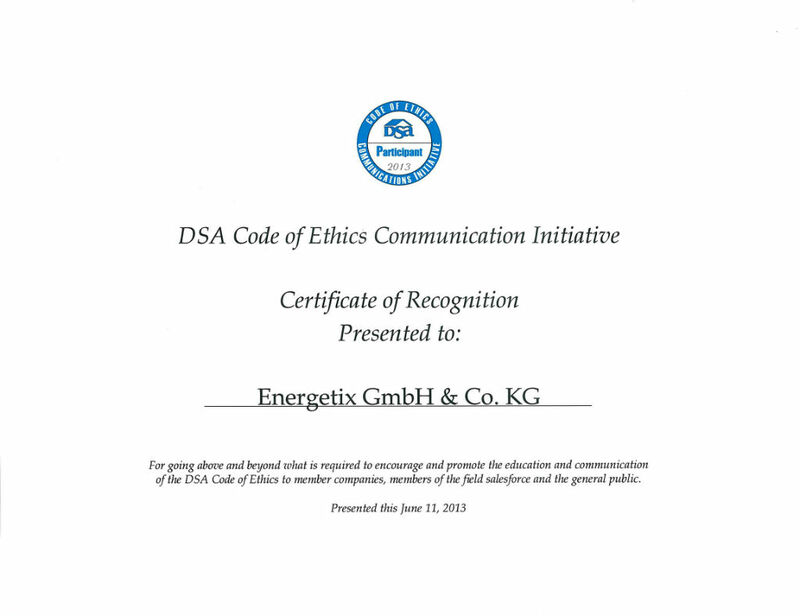 This DSA certification honours ENERGETIX Bingen for its activities in promoting awareness of the association’s Code of Ethics. ENERGETIX Bingen was one of the 52 member companies awarded a certificate for their commitment to consumer protection. 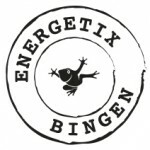 This recognition is based on company activities during the period March 2012 to March 2013 and entitles ENERGETIX Bingen to use the corresponding seal. You can find further information and the DSA Code of Ethics on the DSA website. Joey runs through deserts and on one occasion ran right across the Republic, to mention but a few of his feats. We even reported here on FROGBLOG about his not-to-be-imitated mountain (!) bike challenge in the Baltic Sea. Now there is further news about this Irish bundle of energy who never tires of taking on almost any sporting challenge, no matter how unusual it may be. So Joey Kelly dared to climb to the summit of the Lienz Dolomites with Andy Holzer, an Austrian who has been blind since birth. The report on this event will be broadcast by ZDF at 5.45 pm on Saturday, 10 August. “It was fantastic, we had a great time!” Together with ex-professionals Jeannie Longo (13-time women’s world cycling champion and Olympic gold medalist) and Rudi Altig (former world cycling champion), Joey Kelly embarked on the North Sea Coast Cycle Path, the longest cycle path in the world. The trio covered 2,500 of the 6,200 km long trail. The highlights of their tour through Scotland and England have been summarized in a five-part Arte documentary. Arte will be repeating parts 1 – 3 on 17 August, starting at 2.55 pm (parts 4 and 5 have already been repeated on 8 and 9 August – both at 7.45 am). This enthusiastic sportEX wearer encountered long-time ENERGETIX Launch presenter Ingo Nommsen on ZFD’s “Volle Kanne” programme. The pair talked openly and genuinely about past challenges – such as, for example, Joey’s extreme fast (which we would also ask you not to imitate) – and about planned activities. Click here to view the informative conversation between Joey Kelly and Ingo Nommsen. Anything else about Joey Kelly? Joey also appears as a panel member on the RTL ranking show “Die 25” hosted by Sonja Zietlow, which depicts bizarre and “incredible” events. Fashion journalist and media coach Tanja Bülter will enhance this year’s Catalogue Launch with her charmingly presented insider knowledge of the industry. A fashion-conscious Berliner, she has been hosting numerous events – charity galas, press conferences, society reports, vernissages – for years and is known to a wide public through her appearances on n-tv and RTL TV. ENERGETIX Bingen has now managed to hire this media professional in 2013 to host the jewellery show. This young mother will contribute valuable information and expert tips on ENERGETIX’s eagerly awaited new jewellery collection. The international participants in the Launch can already look forward to her appearance in the Estrel Berlin on 31 August 2013! The visually appealing and balanced display of selected pieces of jewellery is an extremely important factor at fairs and markets and also at home parties. 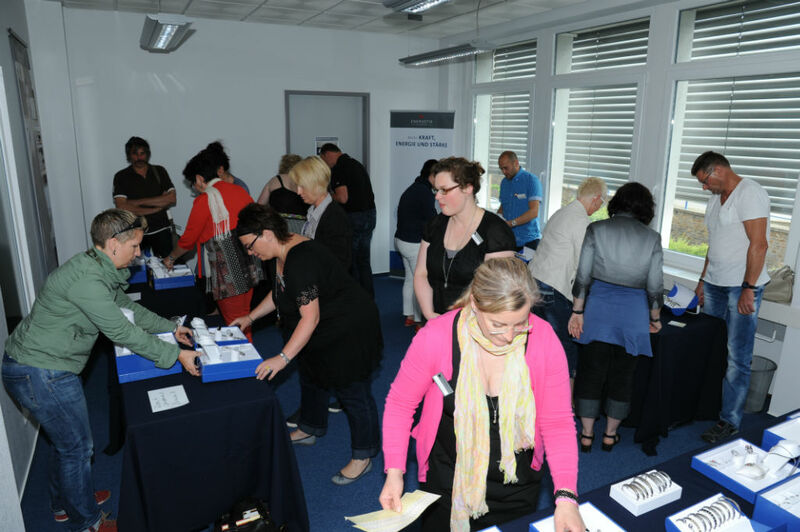 The decorating workshop held during the Bingen event (already reported in FROGBLOG) served to demonstrate the sales-enhancing effect of a jewellery presentation arranged according to professional standards. It is important for beginners to acquire this knowledge and put together a presentation as effectively as possible. The first introductory part of the workshop consisted of a talk by experienced ENERGETIX jewellery designer Janine Eisenhauer. She outlined the basic rules of jewellery presentation that need to be kept in mind when arranging the presentation of goods in a professional manner. A particular highlight of her talk was the presentation of the new ENERGETIX price tickets that complement the ENERGETIX range of information materials. The second part of the workshop was devoted to putting the tips into practice. Participants were divided into groups of two or three and arranged their own presentations. 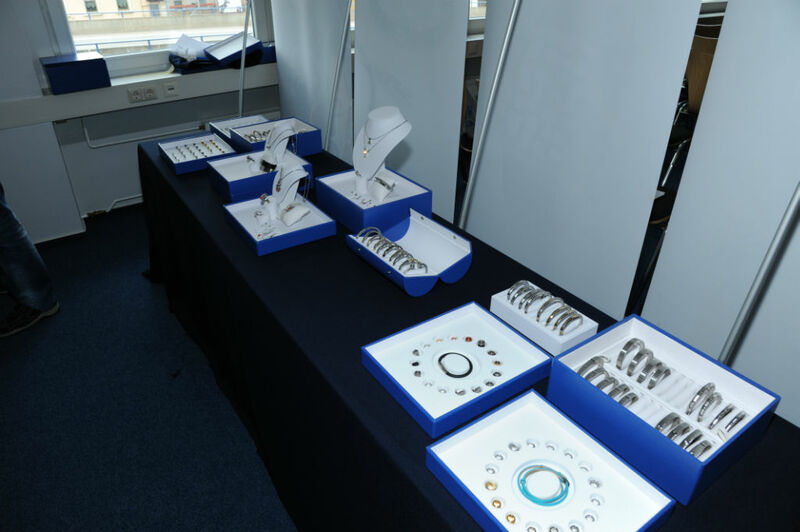 With the help of ENERGETIX sales aids like busts, boxes and decoration displays – and applying the “golden section” rule – all the distributors succeeded in creating professional jewellery presentation tables. The “basic decorating” outlined at the workshop – together with other carefully placed display materials for pendants, bracelets and earrings – can create a good eye-catcher at fairs. Here’s wishing all distributors continued fun and success in putting these ideas into practice!